We are pleased that you, or someone close to you, is interested in seeking baptism for a child at one of the three churches of the Parish of March. The gift of faith is the most precious thing a child can be given. Faith, or more accurately Trust, is about connection to life, God, and Community. Baptism is a Sacrament and Sacraments are defined as – “an outward and visible sign of an inward and spiritual grace”. This means Baptism is intended to connect this visible life with the spiritual reality that is at the heart of all life. This spiritual connection is intended to be a lifelong pursuit which aids us in living fully and with integrity. To help fulfill this, our parish tries to help in the preparation for and living of the baptismal promises. Sacraments in the Christian Church (by tradition seven in total) use simple life-giving symbols to connect us to God and the Community of Faith. 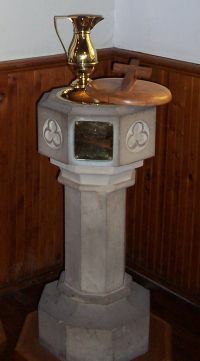 In the case of Baptism, the chief symbol is water. Water is, in human life, essential for our existence. We are born from it, we need it to sustain life, and we cleanse ourselves with it. In Baptism the symbolism of water, reminds us of all these things -- the water of creation, the freeing of the people of Israel from slavery, and the washing away of all those things which inhibit a full life with God in the community. Jesus chose baptism as the way of marking the beginning of his ministry and with Baptism we still mark our entering into the ministry of “the priesthood of all believers”, that biblical image reminding people that we are interdependent with one another and called to love and service in the community and the world. Come to ‘check us out’ and consider becoming a part of our community. Regularly attending worship will give you a stronger sense of ..‘who we are’.. as a parish family. Find out about the many activities we offer to support you on your Christian journey. If you wish to know more about Christian education for your child, contact Kathryn Hancock and Barbara Apro, our Sunday School Coordinators. At your earliest opportunity, have a cup of coffee ‘on us’ in the church hall after the service. Ask to speak with one of our priests – the Rev. Canon Wilker-Blakely or the Rev. Dunn. Allow us some time to get together and get acquainted with one another. Contact the church office at 613-592-4747 to obtain a Baptismal Request Form. Complete and return it. Try to make your home a place where there are resources available to your child to help them learn more about the faith into which they have been baptised. Are You Seeking Adult Baptism? If so, please contact the Rev. Canon John Wilker-Blakely or the Rev. Mervyn Dunn directly or through the Parish Office at 613-592-4747.